SBOT Yesterday (5/11/18) they gave back gains from the prior day of 19% on thin volume. Shares are now at a 52 week low, and we think a reversion play to the mean is warranted with upcoming data releases, and frankly, a reversal of momentum, for reasons we discuss below. Currently shares are trading at $2.19 at the time of this writing, oscillating wildly in a $0.06 range. Here is the five day, 3 month, and one year charts respectively. The basis here is as simple bounce play. There is no technical support, though there is some value in the business model, especially with upcoming data releases. Let us now offer color on why the stock is getting crushed. The stock is falling today because of an equity offering. Stellar announced the pricing of a public offering of an aggregate of 2,075,472 units with each Unit consisting of one common share, no par value per share and one warrant to purchase one common share. Stellar is offering the Units at a price of $2.65 per Unit. Our target price is thus based on a discount of 5-9% under this offering price. As you can see, shares have been crushed. We seek to profit from other investor’s BAD BEATs, and this is an example. The stock is getting hit because of the number of shares being issued. Further, the warrants will be exercisable immediately at an exercise price of $2.65 per share and will expire five years from the date of issuance. The offering is expected to close on or about May 15, 2018, subject to customary closing conditions. Of course, like any developmental and up and coming biotech, the gross proceeds will be used for research and corporate purposes. The proceeds of the offering are expected to be approximately $5.5 million, prior to deducting placement agent discounts and commissions and estimated offering expenses. There are barely any revenues, yet, hence we consider this a developmental company that is burning a ton of cash. This little company is a manufacturer of Keyhole Limpet Hemocyanin (KLH), an immune-stimulating protein utilized as a carrier molecule in therapeutic vaccine pipelines. This tech is being leveraged for targeting cancers, immune disorders, Alzheimer’s and inflammatory diseases. It also can be used for assessing immune system function. We as a society currently lack appropriate monitoring tools that allow a detailed study of the KLH-specific B cell response. So the technology is still in its infancy. Turning to the literature (BAD BEAT Investing was co-founded by a Doctor of Epidemiology), we see that KLH have mainly been evaluated by quantifying KLH-specific antibodies in serum1,2,3,4,5,6 (see linked footnotes). 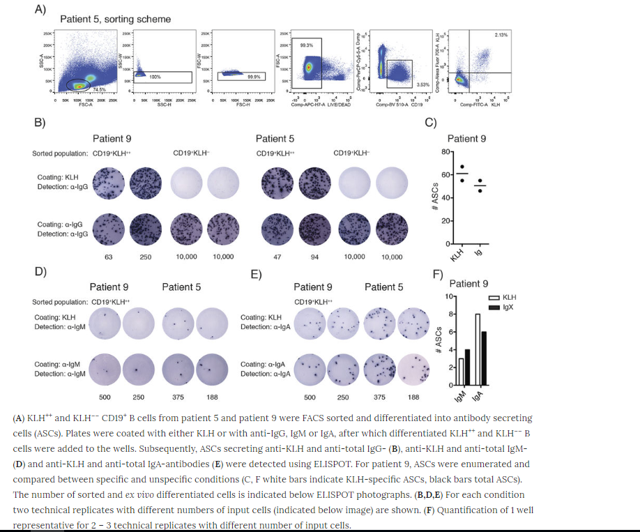 Direct longitudinal analysis of KLH-specific B cells in peripheral blood could provide novel information on the magnitude and phenotype of the KLH-specific B cell response. Below are some results showing promise. Further, KLH can also be used in immunotoxicology studies for monitoring the immunomodulatory effects of drug candidates. Stellar is committed to meeting the growing demand for commercial-scale supplies of GMP grade KLH, ensuring environmentally sound KLH production, and supporting the development of KLH-based active immunotherapies . During the most recent quarter, Stellar continued to advance its optimization and expansion initiatives, which are intended to increase the scalability of the company’s KLH production and manufacturing processes. A number of therapeutic vaccines that utilize the KLH protein as a carrier molecule are currently in clinical studies by third parties. While the outcomes of these clinical trials cannot be predicted, the company is preparing for the possible impact that favorable clinical results could have on the KLH market and Stellar’s supply capabilities. Results from the first of these trials are anticipated to be announced during the summer of 2018. 2) Research and development expenses increased by $0.16 million to $0.49 million for the three months ended March 31, 2018 compared to $0.33 million for the same period last year. The increase was primarily due to research and development activities intended to increase the scalability and throughput capacity of existing manufacturing systems. 3) General and administrative expenses increased by $0.03 million to $0.77 million for the three months ended March 31, 2018 compared to $0.75 million for the same period last year primarily due a non-cash share-based compensation expense in the most recent quarter which was partially offset by reduced corporate expenses. For the second quarter of fiscal year 2018, Stellar reported a net loss of $1.35 million, or $0.90 per basic share, compared to a net loss of $1.10 million, or $0.76 per basic share, for the second quarter of the prior year. Our on staff epidemiologist at BAD BEAT Investing loves this name and thinks that the data that is set to be released later this month will be promising. While we think the risk is to the upside, should this data falter, shares could blow through any stop loss, so make sure you have a stop loss ordered. However, we assume shares will have begun to rebound ahead of the data release, but if the data is strong, we could be looking at a 30% or more gain. That is huge. Like many other high risk biotechs, if the tech explodes with effectiveness and efficiency, then the stock will take off. As research continues, cash burn will continue. We are simply trying to leverage the massive selloff following the undercut of an equity offering. Leverage gains of 6-7%, maybe a little more, and get out (see our quick exit recommendation above). Those who like to trade and have higher risk tolerance should stay up through any data release. NOW JUST 3 SPOTS LEFT. Ready to start winning? Our introductory pricing at 46% off the annual rate is only available to 3 more paying subscribers. After this the price will nearly double as the community continues to grow. We find beaten down stocks, and profit from their reversals, just like this idea! Swing trades are suggested almost daily, along with frequent deep value plays. Dozens of investors are winning thanks to ideas like this and our members profit daily. We’ve generated thousands of profitable ideas, but our best ideas are reserved for our members. Invest in your future by joining BAD BEAT Investing today!